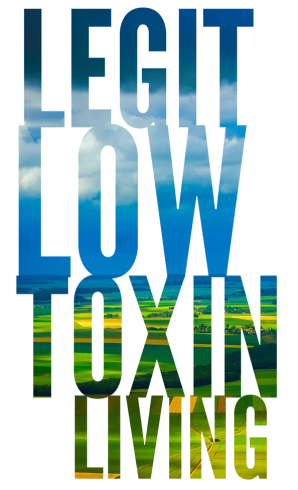 Hi, my name is Lisa, and I am obsessed with Legit Low Toxin Living. This is Myth Busting meets Research Studies meets Crunchy Mom. My goal? Help you get your feet on the ground with this topic so you can make educated choices. I’m not preaching here, although I do think we all hold some responsibility for protecting the planet and the people on it (including the people of the future). When you know better, you can do better. It’s a topic that is easily overwhelming because there are so many details and nuances to it… BUT it’s also an area of life in which you can control many aspects of exposure. Nope, you can’t control air pollution, and you may not be able to immediately control where you live. You may have to park in parking garages sometimes, and go into “sick” buildings, and sleep on chemical laden sheets in a hotel. Your neighbors may spray chemicals on their lawn, and the organic produce you buy may be contaminated with pesticides. An important thing to note here is that you should not go crazy with worry. It’s not possible to control all of your toxin exposure, and the body is actually pretty amazing in its quest to fight toxins. That said, it’s also important to lighten the load for many reasons. Toxins are prolific. And maybe you’ve made it this far without having them tangibly impact your health. But they are cumulative, and by ignoring them you’re choosing to be in the experimental group of the world’s largest longitudinal research study. If you want to protect yourself and your family, it requires effort. Less effort than cancer, autoimmune diseases, and other health problems. What areas of life can you focus on to lower your toxic load?